Fresh on the nose with a delicate sweetness of malted barley, vanilla and cereals, mixed with sea salt and a hint of ozone. Then flavours of coal ash and subtle smoke emerge, mingling with gentle peat and a whiff of tobacco leaves in the background. Bold and intense on the palate. Malty, with sweet vanilla and a touch of cereals. Then spicy notes of black pepper emerge, together with subtle oak, tender coal ash, a hint of peat and dark chocolate towards the finish. Pleasantly warming and mouth-coating. The pepperiness increases with a second sip. The finish is pleasantly long, warm and creamy with vanilla and sweet barley sugar. Becomes slightly dry on the tail with oak, a touch of tar, leather and a whiff of peat smoke. Intense on the nose when water is added, with more coal ash, sea salt, ozone and peat. The vanilla sweetness and barley sugar notes are significantly tamed. On the palate, however, the delicate sweetness is very present with malted barley, vanilla and cereals while the pepperiness is a bit reduced. Slightly warming with pleasant notes of apricots, milk chocolate and a hint of peat. The finish is a bit shorter, still warm and creamy with toffee and vanilla, before subtle notes of coal ash, oak, peat and tobacco leaves take over. 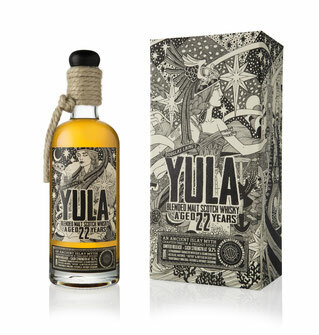 This third bottling of the Yula trilogy captivates with its wonderful balance of sweet, spicy and maritime notes. Nothing dominates, everything's in beautiful harmony. Without water very spicy on the tongue, but the malted sweetness, together with creamy vanilla, do well against it. Also quite interesting to play with some water, as this dram changes in an interesting way. A great blended malt that can be enjoyed very well in front of the fireplace, just in the cold season.